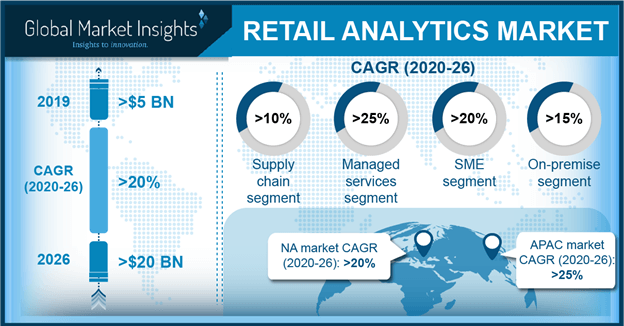 Retail Analytics Market size was over USD 3 billion in 2016 and is predicted to grow at around 19% CAGR from 2017 to 2024. Growing adoption of analytics solutions to help gain competitive advantage, reduce operational costs, and increase profitability is expected to drive the retail analytics market growth during the forecast timeframe. With the increasing technological advancements such as big data analytics, retailers are increasingly focusing on enhancing customer experience. Retailers are expected to use these solutions on a large scale, owing to ease in the decision-making process. Increasing penetration of data-intensive solutions, due to the increase in usage of e-commerce and social media will encourage retailers to adopt retail analytics market solutions. Also, with the increasing number of retailers focusing on offering a differentiated in-store experience to the customers, the demand for such solutions is anticipated to gain momentum in the future. Lack of skilled personnel in retail establishments is expected to hamper the retail analytics market growth during forecast timeframe. However, the organizations are focused on training the business personnel regarding the usage of these business intelligence tools. High initial setup costs restrict the demand across small and medium enterprises. Several new start-ups are providing low-cost, customized options that cater to specific needs of small businesses. The large-scale generation of big data has compelled the buyers to adopt software solution such as data management in the retail analytics market. These solutions enable the retailers to merge data from outside sources such as wholesale inventories with retailers’ POS data and arrive at actionable conclusions. Increasing smartphone usage for shopping is expected to drive the growth of mobile retail analytics market applications. Store managers and sales staff of large organizations use mobile apps to keep track of customers, sales, and store traffic. It is expected to transform business analysis and reporting of operations and sales teams to view the necessary retail metrics. For instance, in 2016, ALDO Group adopted a new mobile business intelligence and reporting tool. The solution is highly interactive & intuitive and is based on SAP Roambi. Merchandising and in-store analytics is expected to dominate the market over the forecast timeline. These solutions help retailers align merchandising decisions with customer expectations. The key areas these solutions cover include assortment planning, product placement, product adjacency, and space allocation. Marketing and customer analytics is expected to grow at a high rate, owing to the need of retailers to keep up with changing customer demands. The retailers are leveraging the development of big data and analytics to innovate continuously, deliver enhanced digital experience to the customers, and integrate digital channels with their businesses. Cloud-based solutions are anticipated to grow rapidly, owing to the reduced costs, high flexibility, and increased security. Hosting data and applications on the cloud allows constant collection of information from multiple systems located in different geographic areas. Growing trend of combining cloud-hosted web analytics with the marketing and sales information is anticipated to bolster the retail analytics market growth. These solutions allow the retailers to track the transformation of prospective shoppers to brand loyal customers. Adoption of advanced technologies such as augmented reality (AR) and artificial intelligence (AI) is compelling the adoption of analytical tools to enable the organizations study customer preferences. Moreover, development of cloud-based BI is expected to provide viable growth opportunities to the industry participants. Cloud infrastructure allows consumers to receive insights on demand without extensive investment in on-premise deployment of IT infrastructure. The U.S. retail analytics market is expected to witness high demand, on account of the rising e-commerce penetration in the region. According to the National Retail Federation, the ecommerce sector in the U.S. is expected to grow at a rate of 8% to 12% in 2017. Furthermore, high adoption rate of advanced technologies and growing need to provide a differentiated customer experience is expected to drive the regional growth. Changing shopping habits of the customers and growth of organized retail is expected to escalate growth in the Asia Pacific retail analytics market. The exponential growth in the demand for smartphones and flourishing e-commerce sector has attracted many global players such as Amazon & eBay and regional players such as Alibaba, Rakuten, Baidu, and Flipkart. This is expected to increase the demand for mobile-based application tools in the region. Accumulation of big data on large scale is expected to spike the APAC retail analytics market growth. The industry vendors include Angoss Software, Adobe Systems, IBM Corporation, SAP SA, Qlik Technologies, Inc., SAS Institute, and Tableau Software, etc. The industry is characterized by a high degree of competition. The companies adopt strategies such as mergers & acquisitions and new product launches to expand their client base. For instance, in January 2017, Oracle Corporation launched Oracle Retail Release 16, a cloud-based platform. The product is intended to enable retailers to deliver a unified experience to the customers across all brick & mortal and ecommerce locations. 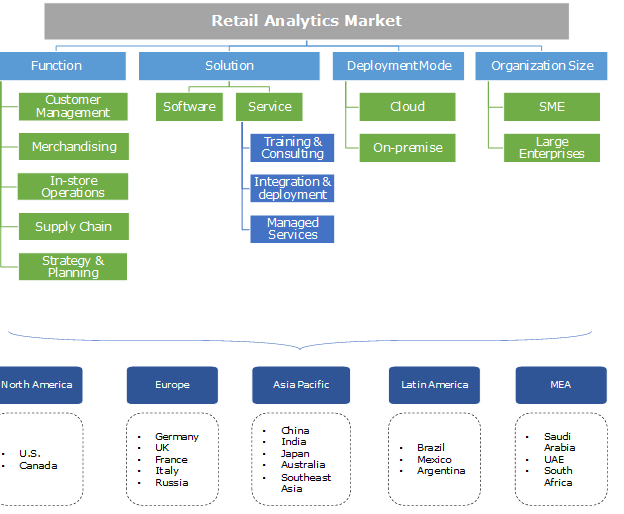 The retail analytics market enables retailers receive insights across the value chain of business operations including marketing, supply chain, store operation, procurement, and customer management. The players in the industry provide vast array of solutions that are customizable according to the user requirements. For instance, Advantage2Retail provides different solutions such as Jesta I.S. for reporting & visualization, JDA for merchandise performance analysis, and Pivot 88 for supply chain management. These solutions have enabled retailers to improve sales performance, increase customer loyalty, analyze profitable customer segments, monitor & take decisions based on store traffic, and create efficient manufacturing & supply chain strategies.